The Commission for Bilateral Dialogue between the Russian Orthodox Church and the Assyrian Church of the East was established during a meeting between His Holiness the Patriarch of Moscow and all Russia Kirill and His Holiness Catholicos-Patriarch Mar Dinkha IV, of thrice-blessed memory, which took place in Moscow on 28 May 2014. On 28 September 2015, the Holy Synod of the Assyrian Church of the East co-established this commission with the following appointed representatives of the Assyrian Church of the East to the Bilateral Dialogue: His Grace Mar Awa Royel, Bishop of the Diocese of California and Secretary of the Holy Synod as Co-chairman; Chor-bishop George Kanon Toma, clergyman of the Diocese of Eastern USA; Priest Ephraim Alkhas, clergyman of the diocese of California and secretary of CIRED; Deacon Roland Bidzhamov, clergyman of the Diocese of Nohadra and the Russian Federation. On 22 October 2015, the Holy Synod of the Russian Orthodox Church co-established this commission with the following appointed representatives of the Moscow Patriarchate to the Bilateral Dialogue: His Grace Bishop Kliment of Krasnoslobodsk and Temnikov as Co-chairman; Hegumen Stefan (Sado), chief librarian of the St. Petersburg Theological Academy; Hieromonk Stefan (Igumnov), secretary for inter-Christian relations of the Department for External Church Relations of the Moscow Patriarchate (DECR); Mr. Sergey Alferov, DECR staff member. On 18 May 2016, the first session of the Bilateral Dialogue met in Moscow, Russian Federation, which concluded in the agreement and publication of this communiqué. The official dialogue between the Assyrian Church of the East and the Russian Orthodox Church opened in consideration of the full-scale persecution of Christians in the Middle East, suffered especially in Iraq and Syria. The Commission recognized the importance of the Russian Orthodox Church’s solidarity with the Assyrian Church of the East and all persecuted peoples of the Middle East. Middle Eastern Christians are being forcibly exiled from the land of their ancestors and many are martyred in the flesh. Their cities and settlements are collapsing, and ancient shrines are being desecrated and destroyed. The Commission expresses solidarity with all suffering brothers and sisters among which are thousands who belong to the Assyrian Church of the East. Support of efforts to preserve Christian communities and the restoration of peace in the ancient biblical land of Mesopotamia and the Levant is an important objective of our dialogue. The Commission recommends practical measures of collaboration in assistance to persecuted Christians, especially through existing aid organizations of the two Churches. The Commission established a cooperation of the Assyrian Church of the East and the Russian Orthodox Church in upholding our common tradition concerning moral values, which are under threat most especially in the diaspora. Furthermore, an agreement of shared moral teaching via respective media outlets was made. 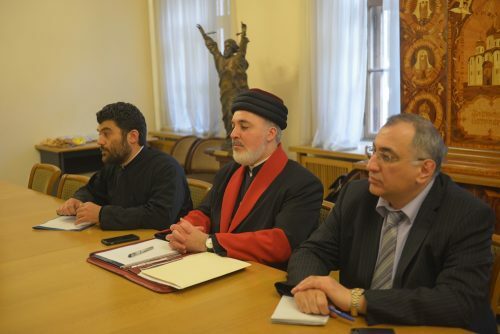 The Commission agreed on the exchange of students and mutual participation in theological studies between the Russian Orthodox Church and the Assyrian Church of the East. Students, professors and experts from the two communities will collaborate to share their respective traditions with each other. The Bilateral Commission formed its agenda for theological consultations, which will prove fruitful for a possible future Pan-Orthodox and Assyrian Church of the East dialogue. A platform for theological dialogue was established based on understanding the differences and commonalities of the two communities. Prior respective ecumenical dialogues of the Russian Orthodox Church and the Assyrian Church of the East will be studied. Additionally, historical exchanges between the Russian and Assyrian Churches, particularly in the late 19th and early 20th centuries will also be studied. Priest Ephraim Alkhas, from the Assyrian Church of the East, and Mr. Sergey Alferov, from the Russian Orthodox Church were appointed co-secretaries of the Bilateral Dialogue Commission. 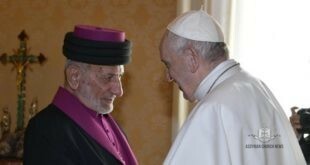 The next meeting of the Commission will take place at the invitation of His Holiness Mar Gewargis III Catholicos-Patriarch of the Assyrian Church of the East in the Spring of 2017.